A splashback in your kitchen is a large visible feature and it needs to be attractive to blend in with your décor. It must also be able to withstand the heat from your cooktop and because of the many liquid splashes, it needs to be easy to clean. Splashbacks usually have a high gloss surface, either with toughened glass, or metal with a protective clear coating. Splashbacks can be made from textured or "slump" glass and can be coloured or patterned for extra visual effect. 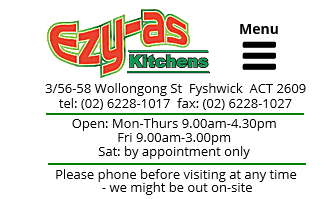 Ezy-As Kitchens can supply many forms of suitable glass in a range of surfaces and colours, and we also supply "Reflections" brand splashbacks made from a metal base with a fully protective and glossy, easy to clean surface. Ezy-As Kitchens can supply many forms of suitable glass in a range of surfaces and colours, and we also supply "Reflections" brand splashbacks made from a metal base with a fully protective and glossy easy to clean surface. Splashbacks usually have a high gloss surface, either with toughened glass, or metal with a protective clear coating. Splashbacks can be made from textured or "slump" glass and can be coloured or patterned for extra visual effect. A splashback in your kitchen is a large visible feature and it needs to be attractive to blend in with your décor. It must be able to withstand the heat from your cooktop, and because of the many liquid splashes, it must be easy to clean. Ezy-As Kitchens can supply many forms of suitable glass in a range of surfaces and colours, and we also supply Reflections brand splashbacks made from a metal base with a fully protective glossy easy to clean surface.